When we visited the bay area last week, Vu’s sister, K, took us to Gochi, a very popular Japanese Tapas restaurant in Cupertino. For a Wednesday evening, the restaurant was packed. Hungry customers filled the narrow hallway, and I overheard the hostess refusing to take anymore reservation because they were completely booked. With a group of seven, we were seated in one of the tatami rooms. The menu was quite extensive but K had been to Gochi a few times so she knew exactly what to order. We started off the evening with the hamachi carpaccio. The garlic-ginger-ponzu sauce complimented the subtle taste of the hamachi, and the fish was very fresh! The crab croquettes came out next. They were creamy and full of crab meat, definitely no filler there. K also ordered the monkfish liver pate. This was probable my least favorite dish of the night. It had the texture of pate but was too fishy for my taste. On the other hand, the beef tongue was very flavorful and tender. The meat fell off with a light pull with the fork. It tasted differently from the thinly sliced beef tongue that you can order at Korean BBQ. I would recommend this dish if you have not had beef tongue before. The boneless fried chicken with eggplant was delicious even though it reminded me of orange chicken from Panda Express. For the stuffed squids, they tasted bland, nothing exciting there. This was probable my second least favorite dish of the night. Being a foie gras fanatic, I had to order the seared Foie Gras sitting on braised daikon. This dish was surprisingly delicious! Don’t expect the same quality as the foie gras that are served at French restaurants. The last two dishes were the highlights of the night—unagi pizza and unagi claypot. The unagi pizza was out of this world! The crust was thin and the amount of cheese was just right. I could have eaten the whole thing myself! Considering that I am not a pizza fan and usually stop after two slices, this speaks volume. For the unagi clay pot, our server mixed the rice, seaweed, veggie, and unagi for us allowing everyone to have equal portion of everything. I loved the crunchy rice! It reminded me of “com chay,” or burnt rice which is very popular in Vietnamese cooking. We ended the night on a perfect note with the green tea crème brulee. Very light and creamy! I am looking forward to attempting this dish one day. Overall, dinner was very good and I would come back to Gochi if we visit the bay area! TGIF! My schedule has been a bit crazy. I worked nine days straight, took one day off, and then plowed through seven more days. Yay for Friday! I managed to step foot in the kitchen today. On the menu are crab tower and passion fruit cheesecake. Crab tower? You must be wondering. A crab tower is a crab salad molded into a tower. My inspiration came from America’s Test Kitchen but I kept my recipe simple. I used the stone crab that I had purchased from Catalina Offshore. It took less than 15 minutes to make, and besides looking elegant, it tasted delicious. The crab was very fresh and both the mango salsa and avocado heightened its sweetness. I paired the crab tower with a glass of prosecco. A perfect light lunch! I exerted self control and managed to save some for Vu. According to him, this was the most refreshing salad he has ever had! This would be a wonder appetizer for your dinner party. As for the passion fruit cheesecake, you have to wait until my next post! 1. Whisk the olive oil, champagne vinegar or white wine, mustard, and mayonnaise in a small bowl. Add the crabmeat to the mayonnaise mixture and toss to coat. 2. Combine the mango, tomato, cucumber, red onion, lime juice and cilantro leaves and mix well. Season with salt and pepper to taste. 3. Toss the avocado, coriander, and lime juice in a medium bowl and set aside. Season with salt and pepper to taste. 4. To assemble, place a 3-inch-wide round biscuit cutter in the center of an individual plate. Press 1/4 cup of the avocado salsa into the bottom of the cutter using the back of a soup spoon. Move the cutter slightly up and press1/4 cup of the crabmeat. 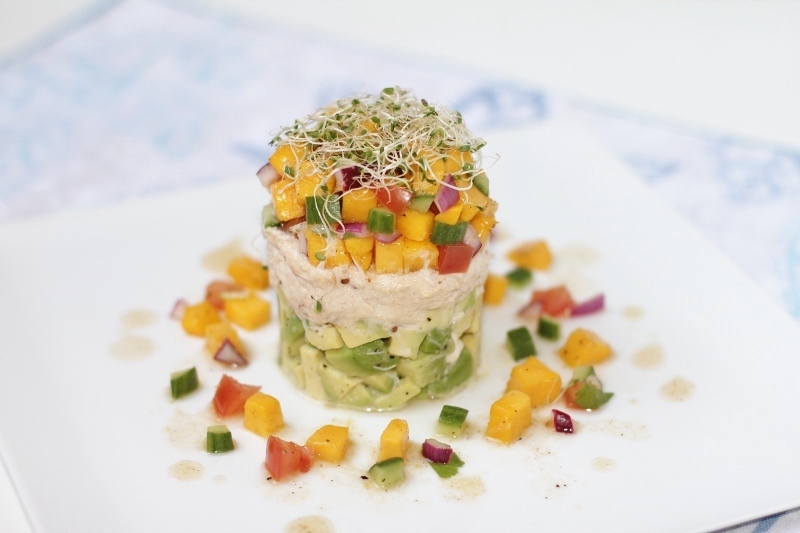 Move the cutter upward and press 1/4 cup of the mango salsa evenly on top of the crabmeat. Gently lift the cutter up and away from the plate to reveal the crab tower. 5. Garnish the crab tower with alfalfa sprouts. Seafood. Lobsters, crabs, scallops, shrimps, oysters, clams, sea urchins… I love them all. I would go to a buffet and eat plates after plates of seafood but feel full after a few bites of ribeye. Seafood is a different story. My friends claim that my stomach has a black hole for seafood. Just a few days ago, my friend, Amy, introduced me to Catalina Offshore, a San Diego seafood wholesaler, where you can buy sashimi grade fish and shellfish for a reasonable price. Many restaurants in San Diego get their seafood from Catalina. You have to order in advance otherwise the good stuff runs out. I got the U-10 diver scallops and stone crabs, not something that you can buy at your typical grocery store. The “U” stands for “under,” indicating that it would take 10 of these scallops or less to make up a pound. 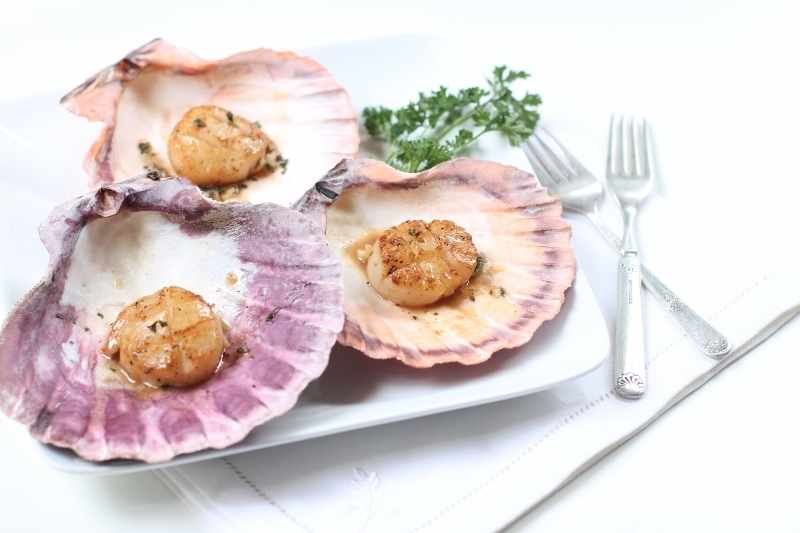 I browsed through my cookbook collection to find a recipe that would showcase these wonderful scallops but failed miserably. Most of the recipes were too complicated and required ingredients that were not readily available in my fridge. In the end, I pan seared them and created a white wine sauce to highlight their subtle taste. I was very happy with the result! The scallops were sweet, juicy, and tender! The key is not to overcook them so they do not turn tough and rubbery. These scallops were absolutely delightful! 1. Slice the scallops in half horizontally and score them on one side. Season with salt and pepper. 2. In a large skillet, heat the butter on high heat until you hear sizzling. Lower the heat to medium and lay the scallops in a circle clockwise. 3. Pan-fry for 1 minute until golden at the edges, then turn them in the same order that you placed in the skillet and cook for another minute. 4. Remove the scallops from heat while you make the white wine sauce. 5. Add garlic, shallot, and parsley to the skillet and sautee them until soft. 6. Add the wine and sugar, and cook for 5 minutes. 7. 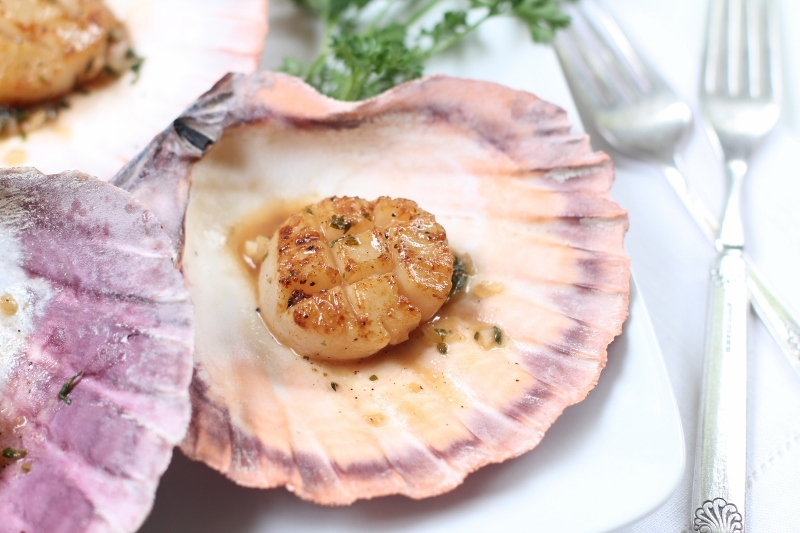 Place the scallops on a plate and drizzle the sauce on top. Serve while the scallops are still hot.